He had been in the army for what seemed a life time. He had risen up the ranks to centurion and took this post in Jerusalem because it looked like an easy job. Keep the peace. No battles which he had seen too many of. He even thought that he would find a wife here and settle down. When he woke up that morning and walked into the praetorium to see what was on the agenda, he saw that there was 2 crucifixions to be held. These things were not his favorite things; but necessary to keep the peace. One of the soldiers who reported to him informed him of the events of the past evening, the arrest of a local prophet and how the crowd was bringing him to have Pilate judge him. He sighed thinking that his easy day may be ruined. When he saw Pilate and the leaders brought in this man he did not look like anything out of the ordinary. In fact, he looked very small and tired and bruised. 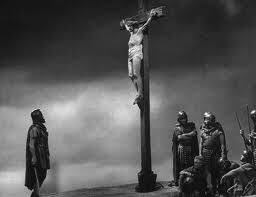 One thing led to another and Pilate gave him and handed over this man to be crucified. The soldiers let him away to have the usually “fun” before they led him to hill outside the city gates. When they were down, the centurion had the soldiers led him back to Pilate who literally washed his hands of the whole deal. “Ecce Homo” rang in the ears of the centurion and the cries “Crucify him” haunted him for some reason. He really didn’t care if the man was guilty or not. He just had a job to do. But, looking into the eyes of this man, something was different. The centurion heard the word “messiah” and “king”. but there was no army. In fact, the man’s eyes just radiated love. On the way up to Golgotha, he saw the man’s mother, a woman wiped his face, women lamenting, and others. He had to grab this man out of the crowd to help him because he was weakening by the moment. When they finally reached the top of the hill, the went about the work of crucifixion like a finely honed machine. Everyone knew their part. When the man was finally up on the cross, he had the appearance of a king who was ruling the world. In the midst of his pain and suffering, the man looked like he was conquering. He heard the talk of the men and women who knew him. He had healed people, talked about a Kingdom where there was peace and joy, he had talked about forgiveness and this man had even reached out to the poor. 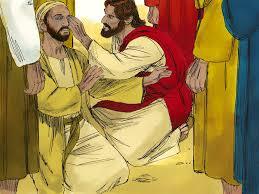 He even heard one story where he healed the son of centurion that he knew. None of this seemed like a crime . Even as they went about the mechanics of crucifixion, he heard the man cry out: Father, forgive them for they know what they do”. There was something happened here that this old soldier couldn’t quite grasp. As he looked up at this man, his heart felt different. It was melting as the suffering man looked at him with love. Eventually, the centurion could see that the man was almost dead. He had one of the soldiers offer him so wine mixed with myrrh to dull the pain and maybe hurry this along. But the man refused. FInally, he heard the man cry out with his eyes toward heaven; IT IS FINISHED. As the heaven opened up with rain, the ground shook and the thunder boomed, from the bottom of his heart, this old battle worn centurion realized who this man was and said: Clearly this was the Son of God! As he looked up, his heart cracked wide opened, and this old soldier of Rome felt his heart filled with the presence of this man called: Jesus of Nazareth, the King of the Jews. Now, this man was the King of this centurion’s life. She was not quite sure how many were coming. Her master just told her that the Rabbi from Nazareth and his friends were going to use the room for the Passover. Her master was cooking the lamb that had been sacrificed earlier in the day and had baked the unleavened bread. Toward nightfall, they began to come in. Men and women who knew each other; laughing and talking to each other. Then He came in. He did n’t stand out of the crowd by his appearance; but there was something about him. She was just about to get the towel and the basin to wash their feet. The Rabbi smiled at her and took the towel, water and basin and he did her work. Then, he shocked her. He gestured for her to sit down, he smiled, and then washed her feet, too. We gather tonight in the Upper Room. Brothers and sisters, disciples and friends of Jesus. Here, no one is better than the other. The greatest among us is the one who serves the other. In this Upper Room, the fundamental job description of a Christian: to wash the feet of the entire world as Jesus did, no matter who it is. In the Upper Room of Jerusalem, Jesus gave the gift of the ordained priesthood. He entrusted the Apostles the role to continue to offer the Mysteries that began that night. But, notice: the ordained priesthood is born in the washing of the feet. My brothers and I in the ordained priesthood are called to walked shoulder and shoulder with every Christian. In fact, he must be the servant of all. 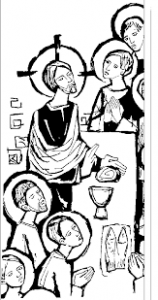 The ordained priest is entrusted with the celebration of the Eucharist not for his own sake but to enable you, the Body of Christ to be fed and care for. Tonight, we share the same divine mystery. The Jesus who sat in the Upper Room and left us this memorial, who was betrayed, who suffered the agony of the Cross and rose again is present among us the Sacrament of the Altar. In this Upper Room, we celebrate our freedom from the slavery of death and sin not through the blood of a lamb, but through the Blood of the Lamb sacrificed on the altar of the Cross. Whenever we gather around His Table, He is in our midst. In bread that is no longer bread, He feeds us with His very Presence. With wine that is no longer wine, we share His Blood. In the sacred meal, we experience and meet our Risen Lord. Our mandate is quite clear: to be Jesus in the world, to live as He did, to offer our lives for all, especially the most vulnerable and most in need. The servant girl watched her new friends leave. They were singing the Psalms of the Passover and moving on to Gethsemane. The Rabbi came over to her to say thank you and hugged her. She had heard the rumors about what the officials wanted to do, but at that moment, her heart knew no fear. She knew just a peace and love that only God can give. As we leave here tonight, may our hearts be filled with the Love and Peace that is our Eucharist Lord. No matter where our journeys will bring us, no matter what is in store for us, we leave knowing that He is with us. He gives us all we need in this holy mystery: His very self. I began the Wednesday night faith sharing group with this question: What character of the Passion narrative do you most identify with? So, I am asking each of you today: what person in the passion narrative do you identify with today? Is it Mary, the sorrowful Mother? Is it Mary of Magdala who wept for her friend? Is it Peter the denier or Judas the betrayer? Are you one of the crowd who yelled “hosanna”; are you also the same person who yelled “crucify him” on Good Friday? Could it be a person in the crowd who just stood in the crowd and didn’t get involved? Could it be the soldier or Pilate or a member of the Sanhedrin? Who is it? What I am encouraging you each to do is to take your person and let him or her walk this Holy Week with you. Let that person teach you something about Jesus and maybe yourself. Enter into the mystery of the most profound moments of our faith. This week is not walked alone; but in the community of the faithful. This week is not about a cerebral exercise. This week is a week of the heart. The sacred rites of this week are the rites of the heart. Who is not moved by the profound act of the washing of the feet? Whose heart is not moved by Jesus’s self giving in the Eucharist? 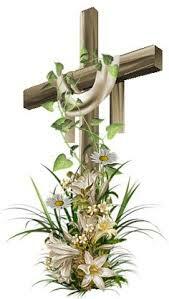 Whose eyes do not fill with tears by Jesus agony in the Garden and how they treated him after he was arrested? Doesn’t your heart break when you see him on the Cross and see the pain in the eyes of his Mother? Don’t you feel the emptiness of the closing of the tomb and the sorrow of the world? This week is not a week of dusty events of 2000 years ago. It is our life lived out today. We experience the reality of the Passion in our own life in every character we hear about. May this week truly be a Holy Week for each of you . May your guide this week lead you to Jesus, our crucified and risen Lord. A few years ago I was on retreat and the retreat director gave me this story of Zacchaeus for prayer. There was one thing that struck me and continue to be a source of prayer: what was His real reason for climbing the tree? Yes, he was short and there was a crowd, but he could have just stood in the front. My thought is he climbed the tree to see Jesus, but also to not get involved or worse yet, h ave to really talk with Jesus. By staying above the fray, Zacchaeus was able to not get involved. 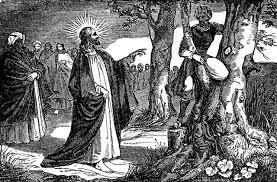 We can all be like Zacchaeus at times. I want to see Jesus; I want to know Jesus, but I don’t want to have to jump into the fray and the messiness of the Christian Live. To be a Christian is to be in the midst of the crowd of humanity; smelly, getting our hands dirty, putting sweat equity into changing this world and letting God use us, by the power of grace, to build the Kingdom. Authentic discipleship, no matter our tradition, means jumping together into the fray and committing ourselves to the common goal of the work of the Kingdom. We cannot truly follow Jesus if we hang out in a tree and remain spectators. Pope Francis has told us: But more than that, we should not wait for people to come to us where we are, but like the shepherd who goes out to find the lost sheep, we need to be going out to encounter people where they are, in the circumstances of their lives and situations.” He spoke these words to a group of priests, but I think this is the challenge to all Christians. In all our congregations, we talk about the lack of numbers; the lack of young people involved. Imagine if we all committed ourselves in this area to make an outreach to all the youth and younger families….Imagine if we went to them and showed them what a Christian is. Imagine if they experienced each of our communities knowing they would be accepted no matter who they were or what the present life’s were about. To me, it sounds just what Jesus did in the Gospel: Come down here, I want to stay at your house”. Here is where our response needs to be. We need to be willing to go into the places no one else will go because those places may not fit into what we think Christians “should” look like. Jesus doesn’t call the perfect; after all, the perfect don’t need God. Jesus calls the imperfect, the sinner, those society forgets or ignores to discipleship. There is a saying, I think captures this point, “the church is not the palace of the saint, but, the home of the sinner”. I guess I am advocating coming down out of the trees of our isolation and fear and work together with God’s grace to build the Kingdom. Do we need a plan? Do we need to know where we are going? God has already given us the plan; he will walk with us in our uncertainty, he will lead us to the places we need to go……we just need to come down out of our trees and let Jesus show us the way. I have been using the Dynamic Catholic daily podcasts for my own Lenten reflections this year. These reflections are the answer when I asked Jesus want he wanted me to do this Lent. In the one on Thursday, he talked about a 100% commitment to Jesus and His way. What a wake up call for me……am I 100% committed to the way of Jesus? The man born blind is a symbol of our spiritual blindness. We may all have an innate fear of the dark but sometimes the dark can be a comfortable place to hide. If we hide in the dark, allow ourselves to remain blind, then there is no need for a 100% commitment to Jesus. After all, how can I build the Kingdom if I don’t see it? Not seeing the opportunities that God places before us, in our minds, absolves us from responsibilities. How can I find Jesus if I stay in the darkness of my sin and fear? Sometimes I really don’t want to be found, to be honest. It is just easier to be concerned about me; sometimes it is just easier to stay exactly where I am because if I let Jesus heal my pain and my wounds and my sins…..I don’t have to change. My darkness is more comfortable even though I might hate it. Notice how Jesus gave the man sight. He spat on the ground and make a mud paste and anointed his eyes. In this sacramental encounter, the man was healed of His blindness and gained his spiritual sight to see Jesus for who he was: the Eternal Son of the Father who came to bring the abundance of God’s mercy into the world. In Jesus, the man began to see the Kingdom of God. The unbaptized were seen as asleep and spiritually blind. The grace of Baptism gave them the sight of discipleship. It woke them up. This same grace was ours at baptism; but are we still asleep? Have we become spiritually blind? Do we choose to remain in the darkness? Baptism is not a one day thing with cute baby in white. Most of us were baptized as infants, but that doesn’t mean that the grace isn’t there today. We were anointed with Holy Chrism and set apart to be priest, prophet and kings, not just for a day, but for a lifetime!.. However, given the gift of free will, we can hide from our identity and remain blind and in the dark, and the world will not change……nor will we. As we walk this fourth week of Lent, beginning right now, may each of us ask Jesus to touch our eyes that we may see……and accept the reality that He will. In this fourth week of Lent, may each of us hold one person in prayer and ask Jesus to touch that person’s eyes and heart so they may see. Touch our eyes with your divine Hand. Take away our blindness and grant us the sight that only faith will give. Touch our hearts with your Divine Light. Enlighten the very depth of our souls with the fire of belief. Grant each of us the courage, like the blind man, to be witnesses to you, no matter what.